In the world of management education which is bugged with myriad choices, two important aspects make a huge difference in the end - the institution and the specialization. Choosing a specialization is the only question that keeps toiling around in the brains of MBA students during the first two semesters. This is particularly true in case of those ones who made up their minds even before opting for MBA programs. Know your strengths and do a self-analysis of things you are good at. 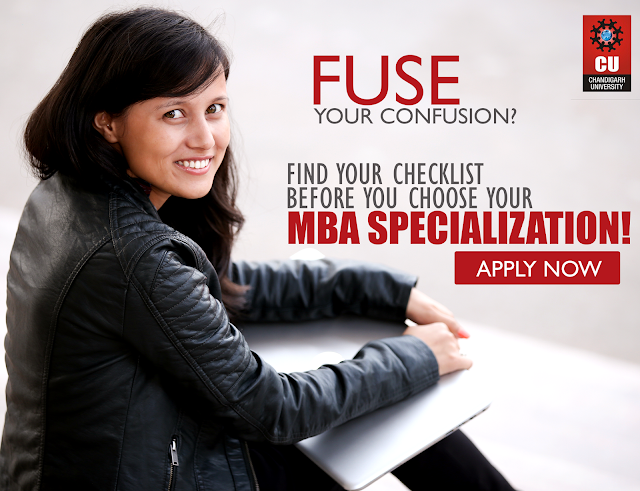 Know the fields your preferred B-School is popular for along with your preference for a one year MBA or two year. There are multiple specializations available today but it’s important that you choose your field of specialization based on your personality, skills, and career goals. But, what you’re interested in is the most important factor to be considered. Considering the span of an average individual’s careers, one can either opt for a one year PG program or a full time MBA program with focus on any of the core functions such as business leadership, marketing, finance or HR depending on your skills. Initially, you must focus on how the specialization will boost your career, and whether you can expect long term employability, rather than being carried away with here-today-gone-tomorrow specializations. Learn about the salary figures of your business school for every specialization. But, do not let the salary structure be the only criteria if you’re really serious about your MBA. If salary figures are great for a specialization but you are too weak to grasp and perform in that vertical, do not choose it. Only if you get paid for what you enjoy doing, you can utilize your skills in the best possible manner. This way, you can benefit yourself as well as the organization you are associated with. To conclude, the combination of the specialization and the association with a particular industry or sector makes a certain amount of difference in terms of individual success or mediocrity. But let us be assured of the fact that whatever specialization we choose, it will require considerable hard work to excel and succeed which will help you transform from competent professionals to inspired business leaders. Chandigarh University offers a wide range of MBA specializations, Visit website to know about programs offering by CU. Admissions Open. Thank you for sharing this useful information. I think all students who want to pursue MBA full time or part time should read this blog. It gives you a clear insight about what the aspirant should be focusing on as I have seen most students focus on the fees rather than forming their own goals and what they hope to achieve from it.